Behind Green Eyes: Etsy Purchase: Glimmer by Erica Twilight Sky. After a lot of internal debate, I finally decided to include Etsy when I browse the net for nail polish. I've been a fan of all the Indie polish & jewellery makers on there for a while, but I'd never actually gone and ordered something. I've no idea why I was so wary of it - it's much easier and cheaper for me to order directly from nail polish makers than it is to order through one of the big websites that ship Indies internationally. 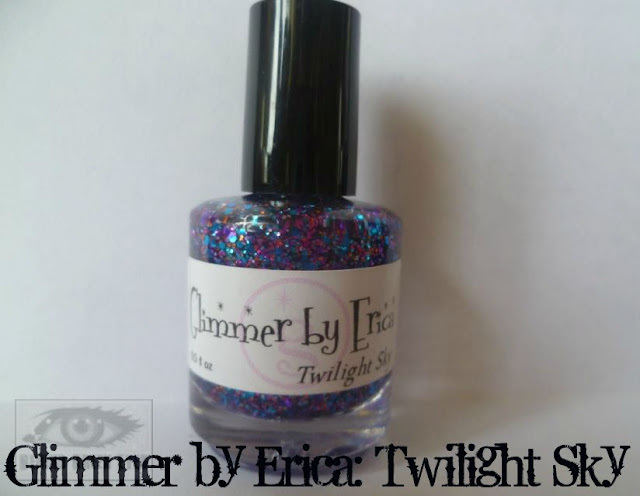 I went for Glimmer By Erica, mainly because of the gorgeous swatches in her shop. The one I chose was called Twilight Sky. To be 100% honest, I wasn't blown away by this when it arrived in the post. I thought I'd just been a bit of an eejit and spend too much on yet another glitter. I said I'd give it a bash anyway, went against all my black/green/blue instincts, and decided to put it over a light polish. I used O.P.I's My Vampire is Buff and two coats (one would suffice) of Twilight Sky. I was a lot happier with it when I applied it - the glitter didn't curl, it was super sparkly, and really easy to apply. The brush was loaded with glitter and there was no digging for sparkle. Every polish Erica makes is 3-free, cruelty free, and hand mixed to order. It's easy to apply, dries quick, and lasts ages. This is only my second ever Indie polish and I can see why people get addicted to them. The polish contains various sizes of purple, blue, and orange glitter (it was the orange that attracted me to it) - and it would look equally gorgeous over any of those colours. There was just that one chip on the corner of my little nail, that was easily rectified with some more glitter on top of it. I currently have a giveaway running to win a £40 voucher for Asos.com - it's open worldwide, you can enter here. A dark purple is always a win for me; I also love matte over everything, lol so this is amazing!! OMGoodness love love love! It looks AMAZING! Also love that its cruelty free! Where can u get it from? never heard of this brand! Durr my bad just seen you said Etsy lol! So going to check this out! Wasn't too gone on it until the last picture! Love that! I have to admit I don't think I will be wearing it over a pale colour again, it's definitely a dark underwear kind of creation! Oh my god with the purple and matte is is absolutely amazing! I want it now! I really liked it over purple too, want to get one with more orange in it! Oh and I think most indies and internationals won't ship to the UK now due to the stupid Royal Mail, so this is one way that you guys get lucky.